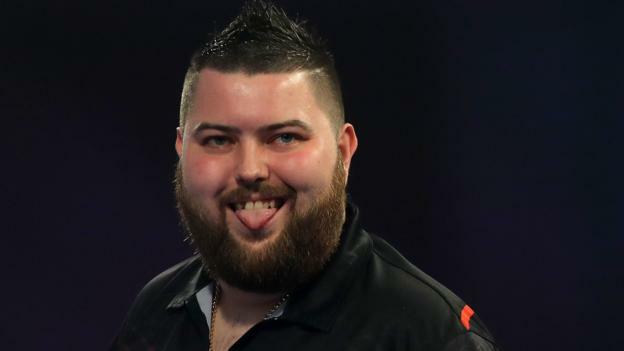 Michael Smith booked his place in the PDC World Championship final after a battling 6-3 victory over Nathan Aspinall at Alexandra Palace. Tenth seed Smith, 28, stormed into a 2-0 lead but tournament debutant Aspinall gathered himself to level at 3-3 as both players produced some big scoring. But Smith then took control of the match and reeled off the next three sets against the world number 73. Smith will play either Gary Anderson or Michael van Gerwen in the final. It appeared Smith was on the way to a comfortable win after taking the first seven legs against fellow Englishman Aspinall. Smith failed to take out a 104 to go 3-0 up and Aspinall took advantage by taking the third set against the darts. Aspinall, 27, composed himself, found his range and began to put pressure on Smith, who held his nerve to win with an average of 105.22. He also hit 17 maximums – an individual record in the semi-finals – and had a 51% success rate on the doubles. “I’ve never felt like that. I’m so happy to be in the final,” said Smith. “I’m one step away from living my dream. Aspinall averaged 100.53 and said: “I’ve enjoyed every minute of it. I never expected to get to the semi-final. “I was so nervous at the start but I made a great game there. Find out how to get into darts with our special guide.